COMING UP: RUNNING DISCOURSES in London, Lancaster and Leeds. | RUN! RUN! RUN! RUN! RUN! RUN! London (Stratford). When: 20th September Saturday 1400hrs – 1500hrs. What: A running discourse in which we talk about running while we run. This one is entitled A Light-Footed & Light-Hearted Rundown of the Olympic Leg-acy and Other Tales of the Exotic East. Come run with Kai in this hands-on, or rather feet-on, exercise. 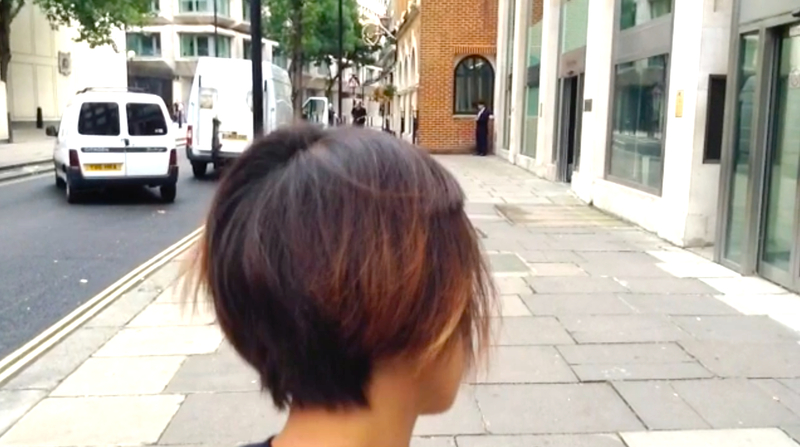 Does running make us see, hear or imagine London differently? Can running create a sense of ownership of the city, as if we ‘run’ it too?’ Hear of Kai’s legendary adventures as ‘Kaidie’ who ran for 1000 days in search of the Meaning of Life in the city of ‘Nondon’ as well as her time as a ‘Nondon’ Ambassador’ during the 2012 Olympics. Also learn about Hitchcock Lane, International Way and why they are thus-named. No running experience required, no running clothes needed – even shoes are optional. Book tickets now. Part of Dr Hillary Powell’s Popup Popup. Where: Meet at the entrance to Stratford International Station (WH Smiths side). 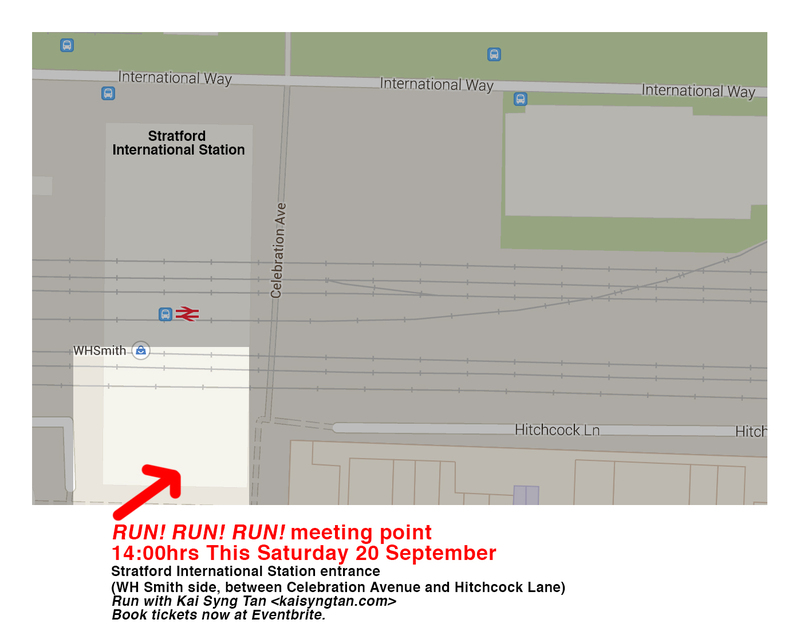 Run ends at Sugarhouse Studios, 107 High Street, Stratford, London, E15 2QQ. Title: The RUN! RUN! RUN! International Body For Research: A Rundown. About: In this performance-lecture, Kai presents a preview of RUN! RUN! RUN! International Body For Research, a spanking-new research institute that she has just set up. In highlighting – in all of 60 seconds! – the key points of its Grand Manifesto, she is also issuing a call for new members, associates and partners-in-crime from different fields. (Neuroscientists, technologists and cartographers, apply now!) Sponsors, of course, are welcome too. This is part 1 of a 2-part performance that explores running as a creative process and how it can function as a playful toolkit for us to re-imagine our world. Dr Kai Syng Tan is an artist, curator, researcher and educator whose work has been exhibited around the world. 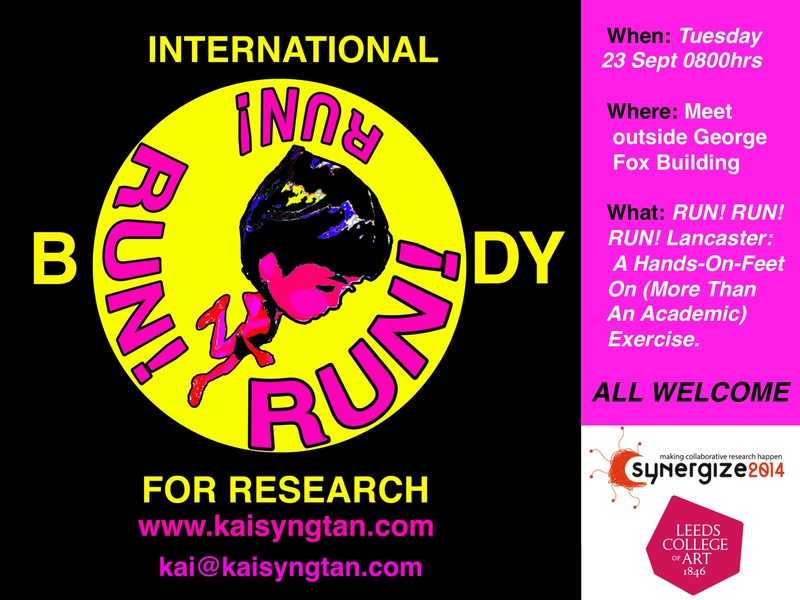 This event follows the critically-acclaimed RUN RUN RUN! 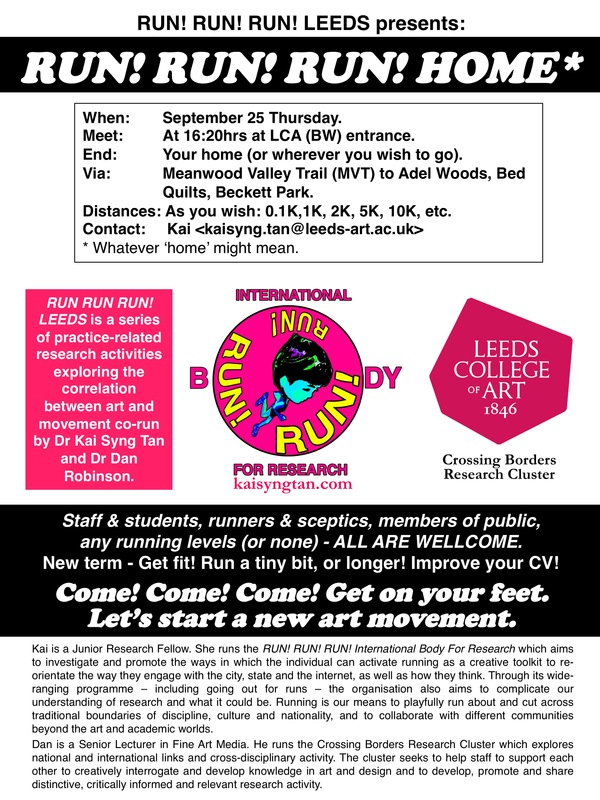 An International Festival of Running 1.0 and is part of a series of academic and artistic acvities co-curated with Dr Alan Latham. She is Junior Research Fellow at Leeds College of Art. 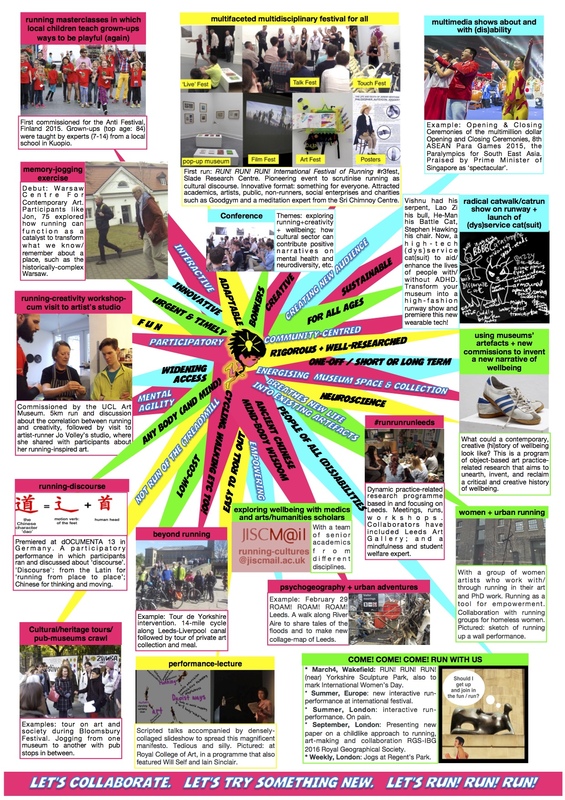 The event is part of Lancaster University’s Synergize2014. About: Come come come get on your feet and RUN! RUN! RUN! with Kai (Kai Kai), the International Body For Research, and together we can create (something of) a new movement. We will walk the talk or rather run the talk, by running and talking – about running and talking. All are welcome – any discipline, and any level of experience in running. The run itself will last for all of 3 minutes, and we will be on time for coffee at 0830hrs. You will leave buzzing for the rest of your day and, indeed, lives. This is a variation of a performance Kai ran at dOCUMENTA 13 in 2012. This event is part of Lancaster University’s Synergize2014. This is part 2 of a 2-part performance that explores running as a creative process and how it can function as a playful toolkit for us to re-imagine our world. What: A run in which we run and chat and Cross Borders with Dr Dan Robinson. PreviousFLOPPY REMBRANDT HATS, SAVING LIVES and CHANGING THE WORLD.